How has everyone’s weekend been? It was super chilly here in NYC with temperatures dropping to as low as 30 °F. I was out in the city all weekend for work and just to enjoy some time with friends and boy was it cold! As the weather is getting colder, how are you all keeping warm? I’ve already seen people whip out their Canada Goose down jackets! For me, that is a bit excessive. I like to enjoy my time without having to be in a puffer jacket for as long as I can! That’s why, I choose to layer. Layering is really my best friend. I find that layering to keep warm has great benefits. But first and foremost, it allows you to look more fashionable! Which is a HUGE plus in my books! When you layer, you’re able to wear outerwear that’s actually trendy, instead of just being a big marshmallow! I admit, not all down parkas are terribly unflattering, but it definitely leaves your silhouette figureless. Besides the fashion aspect, I find layering to be a more practical way to battle against winter chills. Layering allows more combinations for any temperature. Sometimes, a winter afternoon may consist of running an abundance for errands and you may need to wear less. Some winter nights may have drastic temperature drops. I find that layering allows for more flexibility. Here is my 5 step fool proof guide to layering. Choose something that will help you retain heat. Different sports brands and undergarment brands make these type of clothes. Underarmour is a good brand for something like this. If you’re a local New Yorker, Paragon Sports is probably a good place to shop for this. However the most accessible would probably be Uniqlo’s Heat Tech. It is also what I choose to layer with. I like that they have styles for scoop neck, v-neck, long sleeve, short sleeve, tanks, and tees. I also like that they have different material for different degrees of warmth – ranging from regular, extra warm, to ultra warm. This gives even more flexibility to layering that I love. If you want to be PLUS-ULTRA warm – I suggest layering a regular heat tech under the ultra warm for extremely cold days! I also love that they go on sale from time to time. I just grabbed two long sleeve regular heat techs in stores the other day for $4 USD each! For the second layer, I like to wear something that will keep me cozy. Sometimes I am in the mood for chunky sweaters, but actually, chunky sweaters are not really as warm as they are perceived to be. What really matters is the material. My favorite to keep light and non-puffy would be a cashmere sweater. It’s light weight and feels great to touch.My favorite selections are from Everlane – with prices starting from $100 USD for 100% cashmere. I’ve played with the idea of cashmere at different price ranges. I found Everlane’s quality to be your best bang for the buck. I also love that they come in a variety of colors and cuts, so there’s definitely something out there that’s flattering for you. I’m actually trying to “build an empire of cashmere sweaters”. My boyfriend laughs at me and says I can’t build an empire because I’m not taking over the world. I retort back and tell him these little sweaters are basically my soldiers at helping me fight the brutally cold winter!Honestly though, I’m just trying to collect them all in different colors and styles. The possibilities are really endless. It’s not to say, I am ONLY buying sweaters from Everlane. I just try to ONLY buy cashmere sweaters PERIOD. Or at least some type of cashmere wool blend. Because they’re much more worth it than any other type of sweaters – feels so luxe, comfortable, and keeps me ultra warm! In fact, I’m in love with this one and this one, from Theory, and I can’t wait to add them to my collection. If you’re not trying to “build an empire” like me. Honestly, investing in one to two cashmere sweaters should be a winter essential and a wardrobe staple. They’re basic classics so they’ll work with practically anything and you’ll be able to dress them up or down. This extra layer is extremely important. It plays a major role in layering, because it’ll change your warmth level drastically. I find that adding a little down will help retain heat much better. I am highly intolerant of the cold – and this is a big help to me in keeping warm. I love Uniqlo’s Ultra Light Down Jacket because it comes in different cuts for layering with all different types of jackets. They have vests, hip length, and knee length. I love that’s they’re also super nifty and gives you the option to tuck in the collar for a v-cut instead of crew. They’re also truly ultra light and thin so it’s a perfect layer without adding bulk. Top Coat – Throw a Party with Your Favorite Fashion Style! This top coat is going to be your personal party! I find the top coat to be so important in the winter! Because, let’s face it – most people you see, will only see your coat! You’re likely going to be traveling in your coat about 70% of the time and even if you’re indoors, chances will be that it will still be a bit chilly indoors. That – or they blast the heat and you’ll be suffocated and sweating bullets. I love the variety you can do with top coats. With the three previous type of layers, now you can choose a long coat, short jacket, thinner coat, thicker coat, or whatever you want for this top coat! 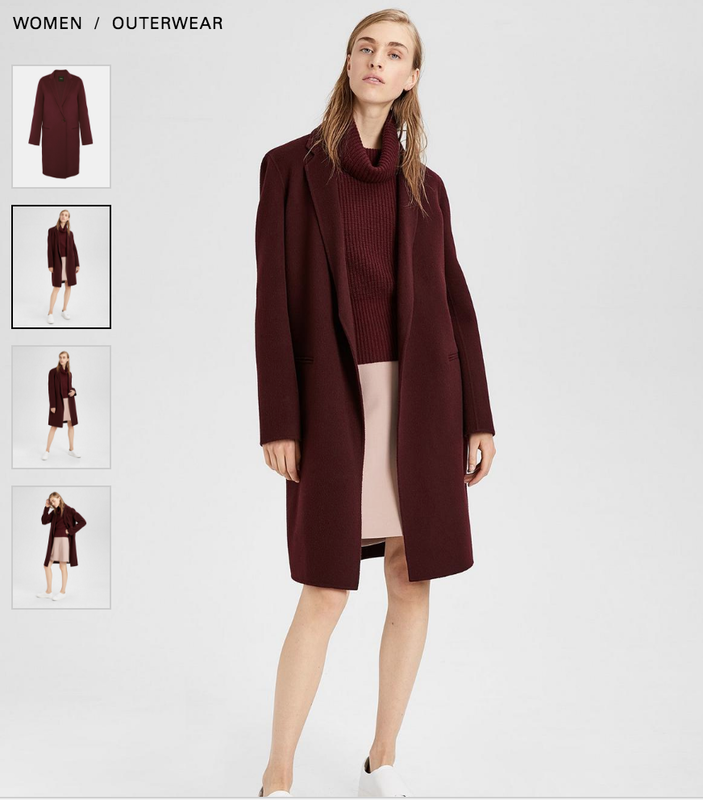 The possibilities are endless!I just bought this gorgeous burgundy long top coat from Theory that’s 90% wool and 10% cashmere for $519 USD after tax! You know how I feel about the warmth of cashmere and wool blends! It’s super thin and unlined, but I know it’ll keep me warm due to it’s material. For a shorter jacket, I got this cute moto jacket with pink faux fur. I love brighter colors during the winter to brighten up my day! It was on sale at Bloomingdales for under $60! The final finishing touch is a good cashmere scarf. Scarfs amps up your entire outfit and it maxes out your warmth level! I love how different colored scarves changes a look so effortlessly! I love a good cashmere scarf because my neck is very sensitive and many types of materials cause rashes. Cashmere is also one of the warmest materials so needless to say, it’s a clear winner for the best scarf pick.The best cashmere scarf you can get in my opinion would be a Loro Piana‘s at $450 USD + tax. It’s a hefty price point alright, but you’ll probably wear it to death. I find it a better investment in terms of cashmere quality than Burberry’s cashmere scarf, which is priced at $435 USD + tax. However, Burberry does have a wider range of colors. 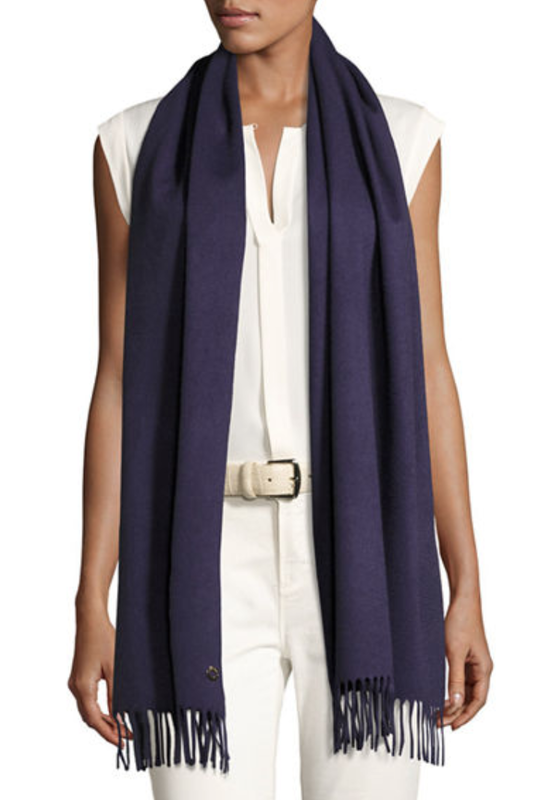 A midrange cashmere scarf would be Theory’s Blanket Scarf at $235 + tax. Or for a cheaper price range, you can get a Portolano Cashmere Fringe Scarf for $60 online at Century 21. The cheapest cashmere scarf I saw was on Amazon for $40, but I can’t vouch for it’s quality.If you’re not 100% set on quality like me, a softer type of wool scarf may suffice. Acne Studio’s Canada Scarf is 100% wool and made in Italy for $180 + tax. You can also get a Moschino Scarf that’s Merino Wool and made in Italy for $50 at Century 21 online. Other ways to keep warm of course includes wearing a hat, as it’s where you lose heat the fastest! Wear gloves and don’t forget Heat Tech socks! Yes they have Heat Tech for socks too and they’ll keep your feet warm and toasty! For bottom layering, I suggest adding a pair of Uniqlo’s Heat Tech leggings underneath your usual pants. They are lightweight and thin, but definitely adds warmth! And this basically sums up my winter layers in one simple picture! Hope this helped you all! Write back and let me know what little tips you use to stay warm and layer! Have a cozy week! This is a non-sponsored post. This post contains affiliate links. These are great ideas! I’m usually wearing a down coat from October through April…I get cold easily! I don’t like the bulk but haven’t found any other way of staying warm. I will definitely be checking these layering clothes out! Hi Kate! I get cold easily as well! I’m the one screaming I’m cold in 65-70’s haha. These layering tips have definitely helped me! Hope it’ll help you as well! I definitely need this! I should be used to this cold weather but I’m really not. My fave out of your list is the scarf layering… it’s easy and warm! I love layering – it’s great when travelling as well, as you can reduce the amount of clothing you need to bring by just adjusting the layers you use. Such a great ideas darling! Love your post!! Estos son los mejores tips para no pasar frío en invierno, un post genial. Great layering tips! It has been so cold outside this past week, so this is perfect timing! Thanks for the outfit inspiration. It is getting colder everyday and we must layer our outfits again. However, layering should still be fashionable! I will check my closet and see which sweaters and coats would match and I’d also have to check my gazillion scarves and pick a pretty one to use. I love using blanket scarfs and long jackets to complete my layered look. You have mentioned some great ideas here! I totally agree! The way under layer is key to staying warm! Great tips lady! 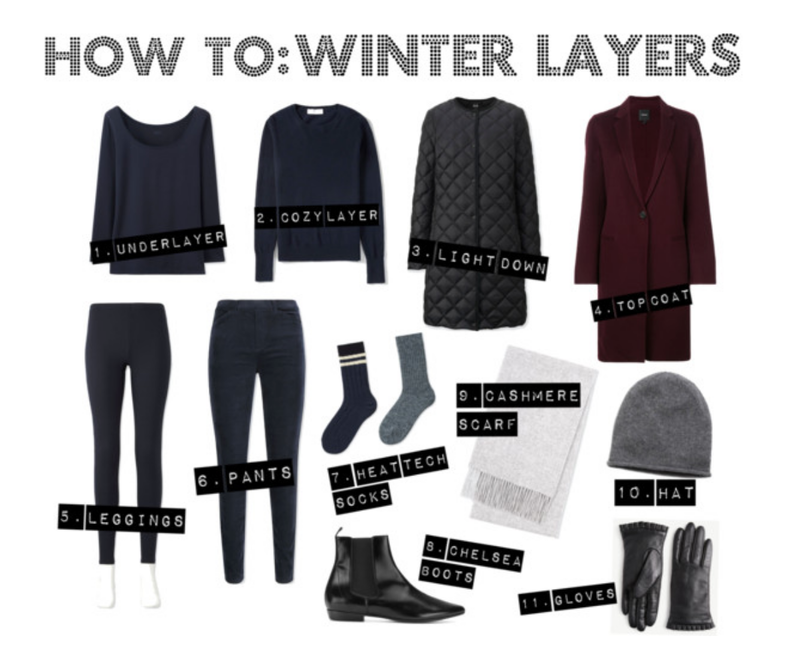 These are great tips for layering! Love all of them! I love what you said about chunky sweaters. I learned very quickly that they are not meant to keep you warm haha But they are so cute!! I am sure to layer them the correct way and pay attention to the material. They are oh so cozy!! I wear a lot of sweaters! I also have different jackets that I use. I’m not sure if I really layer or not. I need to learn how to layer coz it is either too much or not enough ahah! These options are great! This is a great guide for layering. I really like that Uniqlo down jacket, I have a similar one from Uniqlo and its very comfortable and warm. I’ve never been a ‘fashionista’ but I’ve always wanted to mimic the outfits of the girls that dress so cute in the fall/winter. You’ve provided some great advice on how to do so. thank you! I d definitely live in scarves throughout the winter. they’re my favorite layering piece! I am so in love with Uniqlo! They have the best gear for winter. I especially love their heat tech shirts and pants. They really do keep you warm throughout the cold months. I love to layer my clothes when the weather gets colder. It is a great way to be able to adjust to the temperature swings we have here. I just love baggy sweaters. They are so comfy and warm. I like wearing them a lot. I love the winter buys in Uniqlo. It’s pretty basic but very functional. They are very comfortable to wear. Beautiful Ideas especially for the ladies! Don’t forget a cute little hat, too! I live in Florida now, and we don’t need layering much, but when I lived in MN, that top coat was just my style. These are very cool layering tips. It is about time to get some of these items now! The Uniqlo jacket and Loro Plana scarf are the winner for me. I am not a fan of winter season, I get cold easily. It has gotten really chilly here as well! I love sweater weather and layering with cozy knits and scarves. Definitely a few nuggets in that post! Some great layering ideas which I’m sure would be popular in the cold European winters here too! These are really handy and stylish layering tips dear. Thanks for sharing! Couldn’t agree more in this post. Layering is always my fashion especially when winter is here. The inners are the most important. yup layering is definitely the key especially here in Canada ! 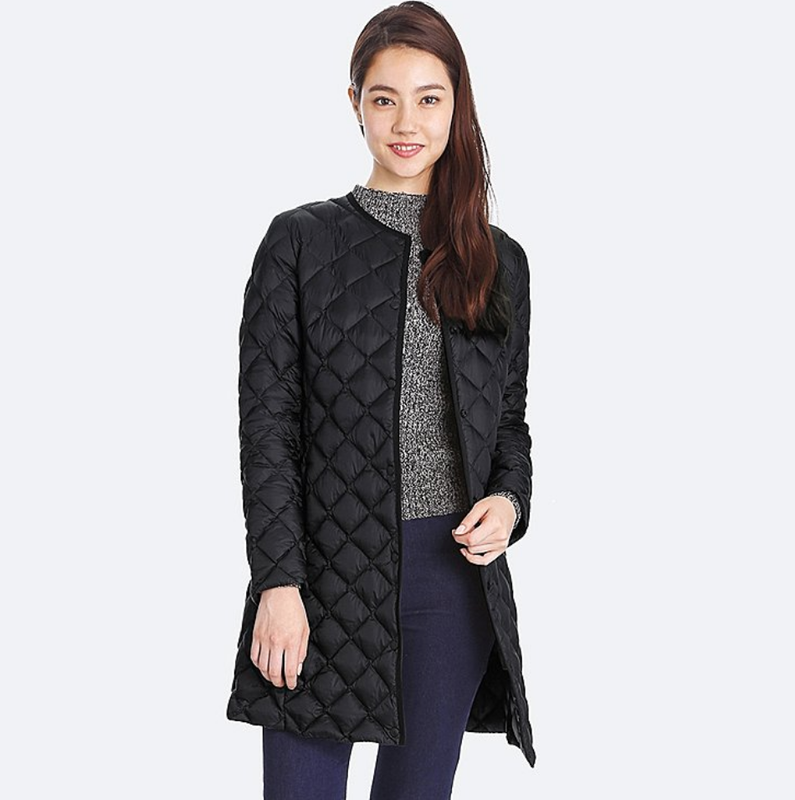 i love uniqlo heat tech , thin material so u can stay warm without looking too bulky! Love the essential coat, from the colour to the design. Plus I love layering too you can never go wrong when all you want to do is be warm. I love the of multiple layers. I am here in Arizona, so it really does not get very cold. I still layer up though, because the weather can change in an instant! They look like the perfect snack with evening tea. My mom makes them too. I prefer mine without cheese though. Cheers!! I love those black boots. I like your point on focusing on the under-layer. I think that’s really important too. Additionally, I wear a pair of woolen socks to keep my feet warm. Cheers!! I don’t live anywhere particularly cold so layering isn’t something I do often. That said, I do visit some places that get extremely cold so I appreciate having some tips to follow! The Uniqlo heat tech pieces are seriously a life saver for me when it comes to the colder months!! Layering is a great idea. I always try to stay away from all those big jackets and coats as long as possible by playing with different variations of layering! I love these tips! It just got cold here where I live (in the 20s this morning!). I will definitely use these to help me layer! These are awesome looks! Really love that big jacket! I needed this when I went to London a few years ago! I layered incorrectly and rather than looking adorable, I looked 15 pounds heavier in every picture!! I love this post, and will reference it throughout the winter! Wow!! great collection i really love it!! this layers fashion styles really amazing for fall &autumn i’m also searching a new layers collection outfits this are really good thanks for sharing a great post. I’m all about the layering. Great post dear! As someone who get cold easily.I love these layering tips. Layering is something I do all the time in the winter months because of living in Upper Michigan. Scarfs are great way to stay warmer I believe. The moto jacket with pink faux fur is so cute. Thanks for sharing the tips. What great pieces! I’m loving that light down coat!